New training seminar "Positive Coach Management" in Khabarovsk. Master course of Positive Psychotherapy in Addis Ababa (Ethiopia). Master course of Positive Psychotherapy in Jimma, Ethiopia. Dear friends and supporters of Positive Psychotherapy worldwide! We are happy to inform you today that at their meeting yesterday in Wiesbaden the WAPP Board of Directors has decided to organize the next World Congress of Positive Psychotherapy this year. It will be the 6th World Congress of Positive Psychotherapy, and it will have the motto: “Positive Psychotherapy: Practice, Values,Identity”. Please save the date for it on 17-22 November 2014! The Congress will be held in a beautiful hotel in Antalya/Kemer, Turkey, for a favorable all-inclusive price for food and accommodation of about 350.- Euros per person plus a registration fee of 150.- Euros for WAPP members and 250.- Euros for non-members. More details about the destination and costs will follow soon. There might be also special travel arrangements from different cities and countries to Antalya. We are expecting some 300 participants from all over the world. Your family members are also welcome. An official Congress website will be online in a few days. Registration and submission of abstracts for presentations will only be possible on this website. If you want to contribute to the congress, please be prepared to submit your paper on the Congress website. Thank you! A very interesting scientific and social program is awaiting you. More information will follow. Please check your e-mails, our website www.positum.org and/or our facebook site “World of Positive Psychotherapy” (www.facebook.com/pages/World-of-Positive-Psychotherapy/147901875254692) frequently for news! We very much look forward to meeting you all again at our next World Congress! The meeting of the board of directors of the World Association of Positive Psychotherapy (Wiesbaden, Germany). Training seminar "Conflict operationalization in Positive Psychotherapy", Kiev, Ukraine. A new book of Dr. Maksim Goncharov "Conflict operationalization in Positive Psychotherapy" has been issued in Russian. Soon will be available in English. Follow us! 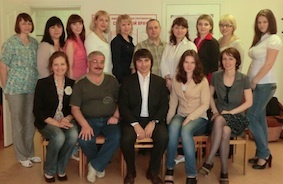 Another Basic Course of Positive Psychotherapy has been accoplished in Blagoveschensk (Russia). 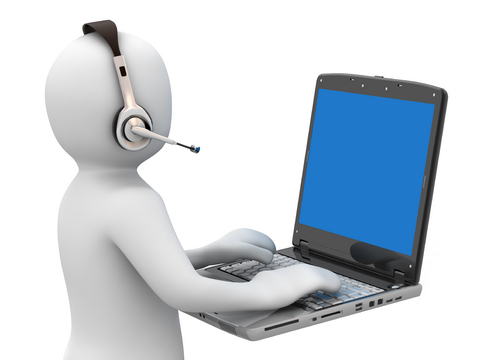 In order to improve my communication with you I want to keep you informed about new webinars and other interesting ventures. Sudcribe and follow. Then you would not miss anything! Fron 7 to 9 of October an annual International Congress of Psychotherapy and Counseling took place in Moscow. Within frames of the congress was a section of Positive Psychotherapy and the conference in memory of Nossrat Peseschkian. In Russia a lot of people knew and loved professor Peseschkian, met him personally and came to express the gratitude and respect. As always the conference in Positive Psychotherapy appeared to be in posittive and very creative atmosphere due to wonderful speeches, great people, positive mood and live violine music. European University of Tirana (UET) and Wiesbaden Academy for Psychotherapy (WIAP) in cooperation with the World Association for Positive Psychotherapy (WAPP), the International Academy for Positive Psychotherapy (IAPP – Peseschkian Foundation), the German Association for Positive and Transcultural Psychotherapy (DGPP) and the European Federation of Centers for Positive Psychotherapy (EFCPP) has strated the Master Program on Master of Psychological and Positive Psychotherapy Counseling (M.Sc). 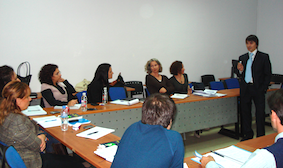 Dr. Maxim Goncharov is one of 8 professors providing the lectures and training just have returned from Tirana. Dear firends and colleagues. 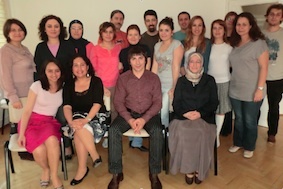 We are happy to report that anual International Training Seminar of Positive Psychotherapy has successfully acomplished. This time it took place from 8 till 11 of September in Frankfurt. For the first time the conception of training has been changed for Training for Trainers. The main target was to exchange of training experience among advanced trainers and new trainers. More then 60 participants from 15 countries attended the training. It was really wonderful. Next training seminar will tak place in August 2012 in Wiesbaden (Germany). “Who works along can only add, who works together can multiply” Oriental wisdom. Dear friends, clients and colleagues. Modern technologies do not stand still but offer new possibilities for communications. Today we are happy to inform you that our Center has open an official microblogg of Center for Positive Psychotherapy on Twitter: @Cpprussia Since now you can receive news and announcements by following us on Twitter. Besides that we will be posting other interesting and useful information that can be applied in your everyday life. You are all welcome! The book of "Operationalized Psychodynamic diagnostics" (OPD-2)" in Russian language. Dear colleagues! We are happy to inform you that 2 year long project of translation into Russian language the OPD-2 now successfuly accomplished. Since last week, the russian translation of OPD-2 is available on the market. The autor training of Dr. Maxim Goncharov has started now in China, Beijing. The training is designed for managers and consist of two modules with 3 days each. It was wonderful, active and loving atmosphere. China is developing very quickly. Not only inducrialically or financially, but also psychologically. International Acadeny for Positive and Transcultural psychotherapy is supporting the project of psychotherapeutical education fro many years now. Recent two years were especially productive. Dr. Maxim Goncharov now has started the fourth Basic cours of PPT. Для всех желающих повысить свою способность управляться с жизненными повседневными трудностями и более эффективно решать свои проблемы мы организовали специальный курс "Психотерапия повседневной жизни". В тренинге могут принять участие любые желающие, вне зависимости от возраста или образования. Программа построена на концепциях метода позитивной психотерапии. Такой тренинг прошел в Хабаровске и будет регулярно повторяться. Всех желающих приглашаем. Помните: Здоров не тот, у кого нет проблем, а тот, кто умеет их рашать" Н.Пезешкиан. Dear friends! All specialists just returned from the V World Congress of Positive Psychotherapy which took place in Istanbul from 8-12 of October 2010. It was great and special event. More then 300 participants from all over the world have attended tht Congress. It was a first Congress without phisical participation of the founder Nossrat Peseschkian. We are grateful to all of the colleagues of the World Association as well as the participants for this wonderful 5th World Congress of Positive Psychotherapy. Among keynote speakers were very well known psychotherapists like proffessor Raymond Battagay, Shridhar Sharma, Manfred Cierpka, Hamid Peseschkian. The respect which was shown to Nossrat Peseschkian and his entire lifework made me proud of him and I hope with your support and new ideas the World Association of Positive Psychotherapy will be even more influential in the future, not only in the field of Psychotherapy, but also for education, integration and world peace. In Istanbul, before the V World Congress of Positive Psychotherapy all specialists of our Center took part in the trainingof Operatioanalized Psychodynamic Diagnostics (OPD-2). The trainer is very well known professor, the chairman of German Board of Psychotherapy, the chairman of OPD task fource Manfred Cierpka. Maxim Goncharov, Pavel Frolov and Ivan Kirillov are working on russian translation of the OPD-2 book. The book is going to see light in November this year. With deep sorrow and unceasing grief, we would like to inform you that Prof. Dr. Nossrat Peseschkian, the founder of Positive Psychotherapy, our beloved teacher passed away on the morning of April 27, 2010. He was great man, a loving and devoted husband, father, grandfather, brother, colleague and friend who has devoted his life to the servise for a mankind through creation of wonderful method of transcultural psychotherapy and personal example. Professional field in Russia knows hin very well. Many of us met him personally. We are happy that in our life was such teacher. Nossrat Peseschkian will be greatly missed by all his family and friends. His soul has taken it‘s flight to the spiritual worlds of God. Dear friends and colleagues! With deep sorrow and unceasing grief, we would like to inform you that Prof. Dr. Nossrat Peseschkian passed away on the morning of April 27, 2010. He was a Loving and devoted husband, father, grandfather, brother, colleague and friend. Nossrat Peseschkian will be greatly missed by all his family and friends. His soul has taken it‘s flight to the spiritual worlds of God. 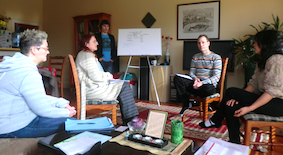 Our trainer Dr. Maxim Goncharov has began a new basic cours of Positive Psychotherapy in Beijing. The training "Effective communication and stress management" for oil factory managers. Stress management training for neurologists of Khabarovsk sponsored by Gedeon Richter. All specialists have attended this event. В Августе 2009 года стартовал новый обучающий курс по позитивной психотерапии в Пекине. Курс начал к.м.н., международный тренер Максим Александрович Гончаров. Группа из 25 человек успешно закончила первый модуль базового курса. Большинство участников курса это практикующие психологи, врачи и консультанты. Группа набралась очень активная и теплая. Следующий модуль пройдет в октябре 2009 года и проведет его тоже международный тренер по позитивной психотерапии Центра Позитивной Психотерапии Фролов Павел Анатольевич. Проект обучения позитивной психотерапии в Китае получил новое развитие. В Августе 2009 года Максим Гончаров провел Пекине несколько тренингов по темам «Стресс менеджмент», «Управление конфликтами», «Эффективные коммуникации». Тренинги проводились для врачей одной из крупнейших больниц Пекина, для сотрудников компании занимающихся программированием, а также для желающих повысить свою психологическую компетентность. Тренинги прошли с большим успехом. Ежедневно в тренингах принимали участие около 40 человек. C 16 по 22 июня 2009 года тренер Международной Академии Позитивной Психотерапии и психотерапевт нашего центра Павел Фролов преподавал на ежегодной летней школе для психотерапевтов в Румынии, г. Сибиу. Тренерская команда, в которой также участвовали Габриела Хум (президент РАПП), Чарльз Сасс (президент Бельгийской Ассоциации Психоанализа), Энвар Ческо (главный психотерапевт Косово) провела мастер-классы по общей психотерапии и построению эффективных терапевтический отношений. Школа была организована Румынской Ассоциацией Позитивной Психотерапии и в ее работе в качестве студентов приняли участие 30 специалистов. Профессор Н.Пезешкиан номинируется на нобелевскую премию в 2009 г.
Дорогие друзья и коллеги. Мы счастливы поделиться с вами грандиозной новостью. Президентом и научным председателем, членом известной международной медицинской ассоциации с головным офисом в Германии Профессор Носсрат Пезешкиан - основатель метода Позитивной и транскультуральной Психотерапии был номинирован на Нобелевскую премию в физиологии или медицине на 2009 год. Профессор Пезешкиан очень незаурядная и харизматичная личность. Его стиль мышления, глубоко человечное отношение и всестороннее исследование проблем, котороые отягощают человеческое общество различного социо-культурного происхождения, смогли достичь тысяч людей в странах по всему миру. Его сфокусированный и личностно-ориентированный подход сделал возможным оказание помощи людям по всему миру, которые возможно не могли ее получить более сложными методами психотерапии. В течение своей жизни он посвятил всю свою энергию достижению мира и взаимопонимания между людьми, помощи людям страдающим от психологических проблем современого мира, предрассудков и суеверий мешающим достичь настоящего мира. Он истинный пример гражданина мира. Мы, как ученики и последователи профессора Н.Пезешкиана безмерно горды и рады столь высокому признанию заслуг этого Великого Человека. Максим Гончаров только что вернулся из трех недельного турне по Китаю, где участвовал в образовательном проекте по позитивной психотерапии инициированным Международной Академией Позитивной и Кроскультуральной Психотерапии. Максим Гончаров провел два модуля базового курса позитивной психотерапии в г. Урумчи (северо-западный Китай, провинция Шеньдзянь), и один модуль в г. Наньдзинь, южной столице Китая. В общей сложности, в проекте приняли участие более 150 специалистов, психиатров, клинических психологов и педагогов. Кроме того, Максим Гончаров проводил частные консультации, воркшоп для транскультуральных семейных пар в городе Пекин. Позитивная психотерапия вызвала огромный интерес у китайских специалистов.